Healthy eating is just easier at home. A yearlong study of 150 overweight people presented at an American Heart Association gathering found that they faced less temptation — and were less likely to cave — at home than when they ate at restaurants. But that doesn’t mean that your home is temptation free. Everything from how cluttered your counters are to whether you keep containers handy for meal prep can make a difference in how well you stick to your healthy intentions. Here are a few science-backed tweaks to make now, so you can eat well. A tidy kitchen may be a healthier kitchen, according to research. A study in the journal Psychological Science found that people were more likely to choose an apple over a chocolate bar after spending time in a clean, organized environment compared to those in a messy, cluttered space. Researchers aren’t sure exactly why chaos cues the chocolate cravings, but Kathleen Vohs, PhD, study researcher and a professor at the University of Minnesota, theorizes that it may be that order cues the brain to stick with convention and follow rules. Has your kitchen counter become paperwork purgatory? Is your refrigerator buried in old grocery lists and long-past invites? Clear the clutter, and you may find yourself making healthier choices. Move your salad plates to a shelf that’s within easy reach. A 2015 study found that when children were given broccoli or carrots before their more-preferred food choices, they consumed more vegetables than when they were served alongside the food they really wanted to eat. And while the study was done on kids, that doesn’t mean the results won’t hold true for adults, too, says study co-author Traci Mann, PhD, professor of social and health psychology at the University of Minnesota and author of Secrets From the Eating Lab: The Science of Weight Loss, the Myth of Willpower, and Why You Should Never Diet Again. “Veggies first is a great strategy because it gets you eating vegetables when you are most hungry, and when you are least likely to ignore them for other, less healthy food on your plate,” she says. You may want to rethink your tendency to bring piping-hot plates and platters to the table for serving. That’s because when people have to stand to dish themselves a second serving, they tend to eat less than when another nibble or nosh is within arm’s reach, Mann says. To make sure you’re eating mindfully, keep dishes on a sideboard or — even better — out of sight. You’ve heard the advice a thousand times to ditch the junk food you have at home. But it’s just as important to focus on the food you want to eat — namely, fresh fruits and veggies — and how you plan to prep and store them. “If you want a snack and you open your fridge, you are going to take something ready to eat, not a vegetable that you have to prepare,” Mann says. “So the best advice is to prepare your vegetables when you get them home from the store, so you’re more likely to choose them when you grab a snack.” Chop carrots and peppers, roast sweet potatoes and beets, blanch green beans — then stick everything in the fridge, she says. Here’s where a bit of foresight can really pay off: If hunting for a matching container and lid regularly irks you, invest in a new set, so prep doesn’t feel like a pain. Research has shown that eye-level items tend to sell faster at the grocery store. In fact, one study in the Journal of Applied Behavior Analysis found that potato chips placed on the middle shelf led to the highest percentage of purchases over those on higher or lower shelves. Keep this in mind when stocking your kitchen cabinets: “You want to keep all of your healthier foods and snacks in the most convenient cabinet and at eye level,” says Abbey Sharp, RD, a dietitian at Abbey’s Kitchen, so the next time you mindlessly pop open the cabinet, looking for a nosh, you’ll glance at air-popped popcorn rather than potato chips. “Likewise, you’ll want to put the less healthy options in higher up cabinets and as far back as possible.” As they say: Out of sight, out of mind. Ever thought about how your serving utensils might affect portion size? Researchers at Boston College and Florida State University have — and they discovered that when subjects served ice cream using a cute, playful spoon, they served themselves more scoops than people who used a regular, plain spoon. Researchers theorized that the whimsical scooper may have subtly cued the brain to think of fun and rewards — and pile on the cold treat. 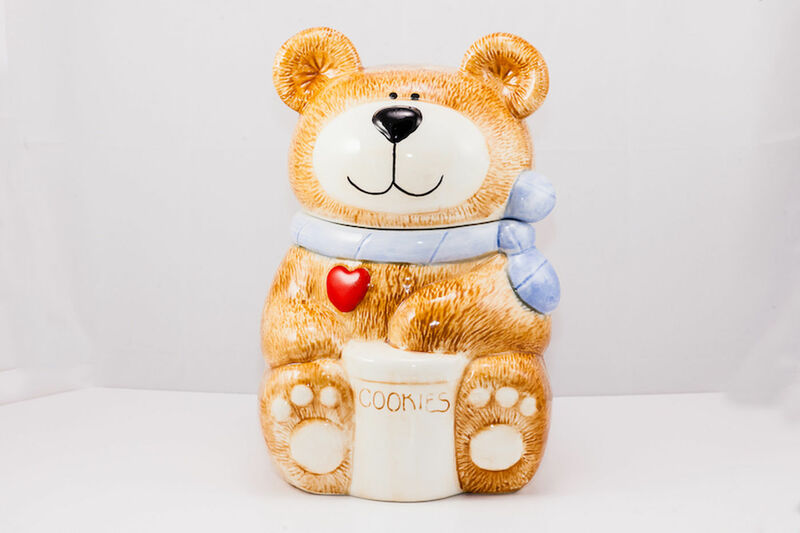 That alligator ice cream scooper or teddy bear cookie jar may not be as innocent as it looks. Copyright © 2018 Rally Health, Inc. All rights reserved.